Let’s say goodbye to 2016 – its triumphs, its successes and all the fun that was had in Arlington this past year. Here’s the final list of weekend goodies for you and your pals to partake in before 2016 is over and done with forever. The UT-Arlington men’s and women’s basketball teams take on Coastal Caroline University in a fun holiday doubleheader at College Park Center. Saturday at 2 p.m. Get tickets. Division Street Brewing: Ring in the New Year AND celebrate Division Street Brewing’s 1st anniversary, where $20 gets you five pours and a souvenir glass. Begins at 4 p.m.
J. R. Bentley’s: This Downtown Arlington shindig will include no-cover-charge live music, a free champagne toast, and party favors. Begins at 8 p.m.
Alley Cats Entertainment: Finish off 2016 in an explosion of fun at the Alley Cats party, where you can bowl, climb, shoot pool, play laser tag and video game ‘till you drop (or at 2 a.m. when they close, whichever comes first). Begins at 6:30 p.m.
Arlington Skatium: Another fun option for the entire family. Skate your way into 2017 at Arlington Skatium’s All Night Skate Party, featuring groovy tunes, pizza, hot dogs and more. Begins at 7 p.m.
Rio Mambo: The 15th annual Mambo til Midnite party will take place at home of some of our favorite margs in the city! From 8:30 pm to 1 am, enjoy a shrimp bar, street taco bar, flauta bar and dessert on top of a live DJ, party favors and a chocolate fountain! At $29.95 a person plus tax and gratuity (reservations required), this sounds like an excellent deal for those of us who want to celebrate with a meal, good drinks, and a dance party. Chamas Do Brazil: Make your reservations now to sip champagne and eat all the meat you can with your special ones-- Brazilian style-- at Chamas do Brazil! 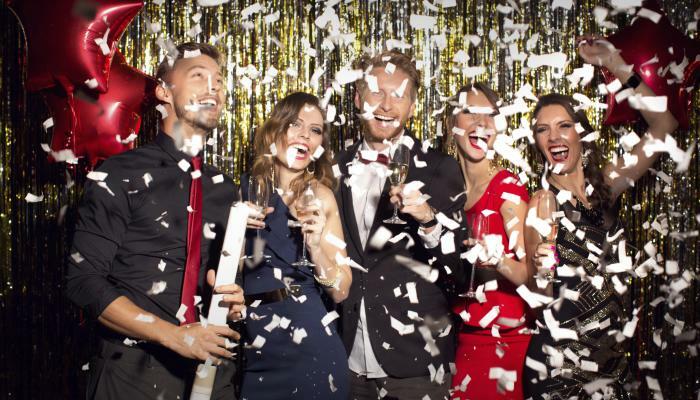 Dave and Buster&apos;s: Get a special all-inclusive package from Dave & Buster&apos;s for New Years that includes a dinner buffet, power card for games and much more! They close at 1 am tonight, so win cool prizes while you ring in 2017! Arrive hungry. Blue Mesa offers one of the most famous brunches in these parts, featuring champagne, mimosas, and a ginormous buffet of sweet and savory delectables. Those New Year’s diet resolutions don’t go into effect until the next day, right? Sunday, 9 a.m. to 2 p.m. Find out more. It’s the most wonderful time of the year at Six Flags Over Texas, when Texas’ premiere amusement park transforms into a winter wonderland that’s filled with fun, thrills, and tons of live entertainment for kids and adults. Friday, 2-10 pm; Saturday, noon to 10 p.m; Sunday, 2-10 p.m. BONUS: Buy a 2017 Season Pass and get free admission to Holiday in the Park. Find out more. Get tips for your Holiday In The Park visit. Celebrate the end of the holiday season in classic style with a turn or two around the ice rink, followed up by a holiday movie, a bite to eat, or shopping at your choice of more than 100 retail destinations. Dates and times: Public skate hours are available daily, including New Year’s Day. See website for details. Find out more. No doubt about it, the UTA Planetarium is one of Arlington’s most fascinating destinations. If you haven’t yet made it to a show, take advantage of holiday downtime to cross this wonderful experience off of your Arlington bucket list. Dates and times: Open Tuesday through Sunday during the winter break; call or click for showtimes and holiday closings. End your year on a cultural high at the Arlington Museum of Art, currently featuring a once-in-a-lifetime exhibit of ceramic works by none other than the legendary Pablo Picasso. Tuesday-Saturday from 10 a.m. to 5 p.m.; Sundays from 1 to 5 p.m. (Call to confirm holiday hours). Go behind the scenes for an unforgettable look at one of the greatest event venues in the world, Arlington’s AT&T Stadium. Noteworthy tour stops (subject to availability) include the press box, the interview room, the Miller Lite Club, the Dallas Cowboys fine art collection, and the playing field. See website for dates and times.